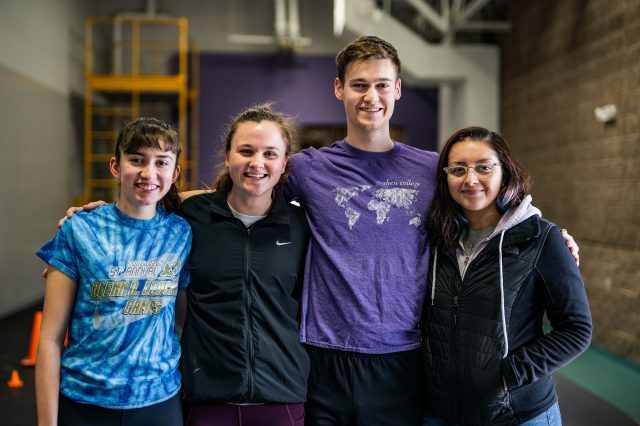 While many students are heading somewhere warm for Goshen College’s mid-term break, four Goshen College track and field athletes will instead travel to frigid Brookings, South Dakota to represent the program at the NAIA indoor track and field national meet. Junior Siana Emery, sophomore Suzette Rodriguez, and first-years Hayley Bickford and Simon Graber Miller will leave early in the morning of Feb. 27. All athletes will compete on Friday, March 1. Head coach Rustin Nyce, throws coach Nick Banke and jumps coach Kyle Mischler will join the four athletes on the trek to South Dakota. While Goshen College racewalkers have become regulars at the national meet, this is the first time a high jumper has qualified since Mishler in 2014. Rodriguez is the first thrower to qualify from GC since 2009. Miller achieved the ‘B’ standard in the high jump early in the season, during his first ever collegiate meet. Two weekends ago, at the Crossroads League conference meet, Miller’s leap of 6 feet 7.75 inches got him an ‘A’ standard and was good enough for fourth at the meet. He is now ranked 14th in the NAIA. Additionally, he now holds the school record for the indoor high jump, breaking the previous mark of 6 feet 6.75 inches. Rodriguez met the ‘B’ standard in the weight throw with a toss of 15 meters 87 centimeters late in the season. She bettered that mark with a massive personal best of 16 meters 29 centimeters at the Crossroads League conference meet the following week. This is her first time qualifying for the national competition. That effort was a school record and conference record, winning the meet and securing her the ‘A’ standard. Rodriguez is ranked 12th nationally in her event and is the NAIA’s top sophomore weight thrower. She describes her thought process, saying, “Once I step into the ring, nothing else should matter. This is definitely a mind over matter type of sport, which is why I love it. Emery, who has made two previous trips to the indoor national meet, is currently ranked third in the NAIA in the 3000-meter race walk. Bickford, who is making her debut on the national stage, is ranked eighth in the same event. Emery hit the national ‘A’ standard while winning a Goshen-hosted event earlier this semester. Bickford met the ‘B’ standard in the same race. Looking ahead to May, two Goshen College athletes have already qualified for the outdoor track and field national meet, to be held in Gulf Shores, Alabama. Vincent Kibunja, a senior, and Salvador Escamilla, a sophomore, hit the ‘A’ and ‘B’ standards, respectively, for the marathon by running a half marathon last semester. Escamilla states his primary goal is to make nationals in the steeplechase, while Kibunja has his sights set on the 5000 meter race. Events in next week’s competition will be livestreamed from the NAIA website and results will be posted online immediately following each event. The Goshen College track and field social media accounts will also be active with live updates.